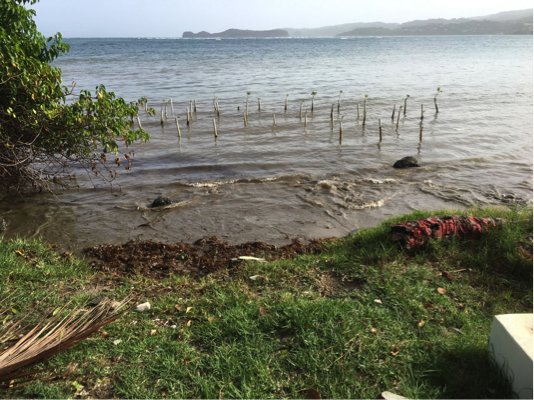 A series of workshops were conducted in Grenada to identify requirements for native mobile apps to help Caribbean Island communities better prepare for and recover from hazards and disasters with ecosystem-based adaptations. 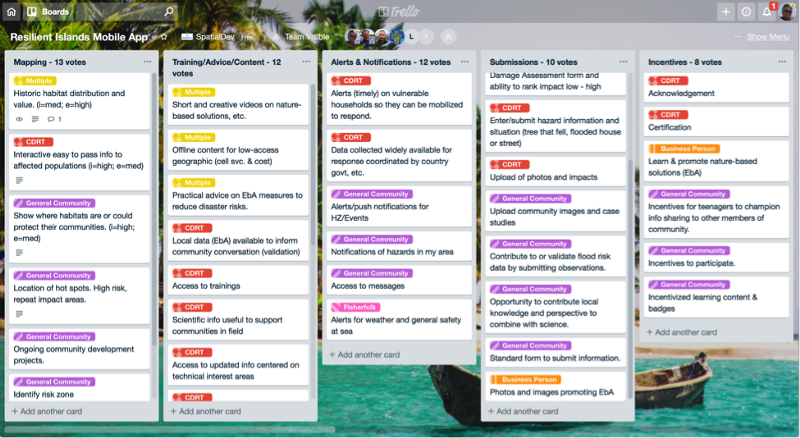 A team comprised of TNC and ARC representatives from across the Eastern Caribbean and US met with government representatives and members of coast communities to set goals for a mobile app, identify target users and define priority features. The first meeting with government stakeholders was hosted by the American Red Cross and covered the processes in place to evaluate vulnerabilities and capacities then prescribe ecosystem-based solutions. They were then briefed on the mobile app assessment process and given an overview of the existing Red Cross Hazards mobile app. 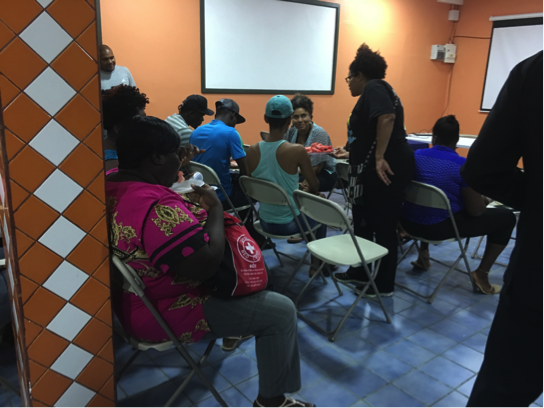 The stakeholder group provided encouragement and validation for the team to develop a mobile app that provides value to the community as directly as possible. A second exercise elaborated on the target groups and defined them down to user personas. Each persona provides a detailed profile for specific user types including their demographics, competencies and typical information needs and habits. A total of 8 were created. The group then prioritized the personas to identify which are the focus for the app. 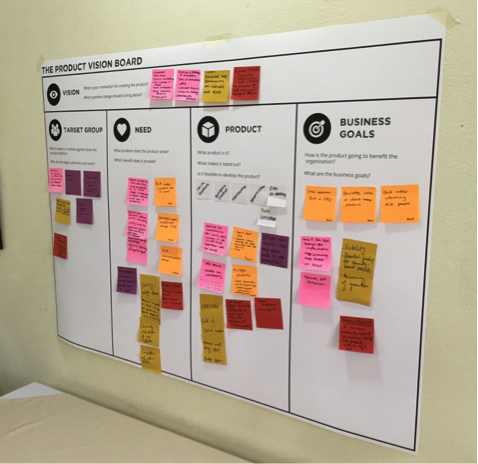 The priority personas were used to elaborate user needs down to specific features. Features were described on color-coded post-it notes to keep track of which feature was address what user need. This distinction was maintained in order that feature priorities would be reflective of the priority users. Once a comprehensive set of features were written, they were grouped into classes. The primary resulting classes were as follows: Map, Training & Advice, Alerts & Notifications, Submissions, Incentives and Usability & Accessibility. The last step in the workshop involved voting by the participants using sticker dots to capture feature priorities. The third day of workshopping started off with a review of the prior day’s work and preparations for the community workshop in Grenville. The team started with a field trip to several sites in the Grenville area including the site where a fisherperson facility (boat launch and catch cleaning stations) will soon be constructed and then to an area of mangrove plantings. The field trip also brought us a glimpse of the serious erosion occurring in the area and presented a stark image for the vulnerability the communities live under. Day ended with a community meeting including several active fisherfolk. The meeting served as an opportunity to validate feature priorities; collect additional ideas; and learn how mobile devices and apps are being used. We heard some great new ideas and found that the community is already steeped in using mobile to communicate and access information. Next steps for the project will flesh out the priority features with more specifics and develop some design concepts and an implementation roadmap. Priority features for the mobile apps are being developed collaboratively using an online feature backlog.